A look at Newsday’s top 10 NCAA women’s lacrosse teams as of April 15, 2019. The Eagles staved off Virginia Tech for a 16-13 win behind three goals apiece from Sam Apuzzo (West Babylon), Cara Urbank (Sacred Heart), Kenzie Kent and Dempsey Arsenault. Jenn Medjid (Garden City) caused two turnovers. Boston College has yet to slip, but Maryland is coming on fast. The Terps fought more than Northwestern in a 17-13 win on Thursday. A lightning delay with 13 minutes remaining forced an impromptu venue change to Northwestern’s indoor facility, as the forecast looked bleak. That didn’t deter the Terps, who came back from two three-goal deficits to win. Caroline Steele had five goals and one assist, and Erica Evans had four goals. Outscoring Butler and Duke by a combined 35-8, Notre Dame jumps a spot in the rankings. Nikki Ortega (Centereach) had one goal and four assists against Duke, and Samantha Giacolone (Eastport-South Manor) made seven saves. 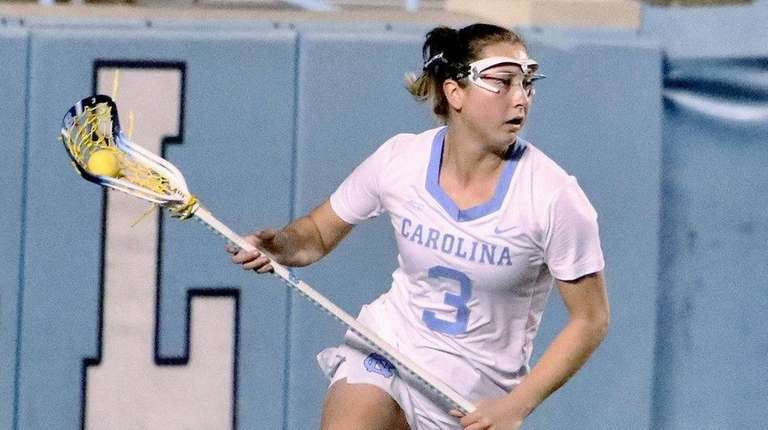 The Tar Heels earned a much-needed 11-5 win over ACC rival Syracuse, backed by one goal and six assists by Katie Hoeg (Mattituck). Taylor Moreno (Huntington) made 12 saves in one of her biggest performances of the season. The Orange beat Virginia Tech, 14-13, then fell to UNC. Megan Carney had four goals and five assists against the Hokies, and Meaghan Tyrrell (Mount Sinai) added two goals. Nicole Levy (East Islip) had three assists. Beating Louisville isn’t flashy, but it’s still an ACC opponent. The Cavaliers won, 16-12, behind Sammy Mueller’s six goals. Maggie Jackson had two goals and four assists. Charlie Campbell (St. Anthony’s) made nine saves to secure the win. The Wildcats had Maryland on the ropes but just didn’t have enough to hold down the Terps, even behind Selena Lasota’s six goals. Northwestern faces two major tests this week in Michigan on Thursday and Notre Dame on Saturday. After getting blown out by Maryland last weekend, the Wolverines responded with a 12-8 win over Rutgers. Caitlin Muir’s five goals paced the attack, and Morgan Whitaker contributed three caused turnovers and three ground balls on defense. Drexel proved no challenge, but James Madison needed two overtimes to beat Hofstra, 9-8, on Sunday. Maddie McDaniel scored the winner 2:55 into the second OT to keep the Dukes unbeaten in CAA play. The Tigers are peaking. They’ve beaten Dartmouth (which just beat Penn), Loyola and Harvard the last three games, setting themselves up for a run in the Ivy League tournament. Sam Fish made eight saves in the 14-12 win over Harvard. Cornell at Syracuse, 7 p.m.
Princeton at Penn, 6 p.m.
Michigan at Northwestern, 4 p.m.
Wagner at Bryant, 7 p.m.
Penn State at Johns Hopkins, 5 p.m.
Towson at Hofstra, 7 p.m.
North Carolina at Duke, 7 p.m.
Princeton at Yale, 1 p.m.
Northwestern at Notre Dame, 7 p.m.
Hofstra at Delaware, 1 p.m.